Mt. Elway, err…I mean Elbert, is Colorado’s tallest mountain and the second tallest in the Continental United States. It is also the tallest mountain of the Sawatch Range, a range filled with towering monsters that boasts 4 of Colorado’s 5 tallest peaks (Elbert #1, Massive #2, Harvard #3, and La Plata #5). Elbert anchors this proud range nicely. Yet another, sometimes underrated, accolade is that Elbert is also the highest mountain in the American Rockies. 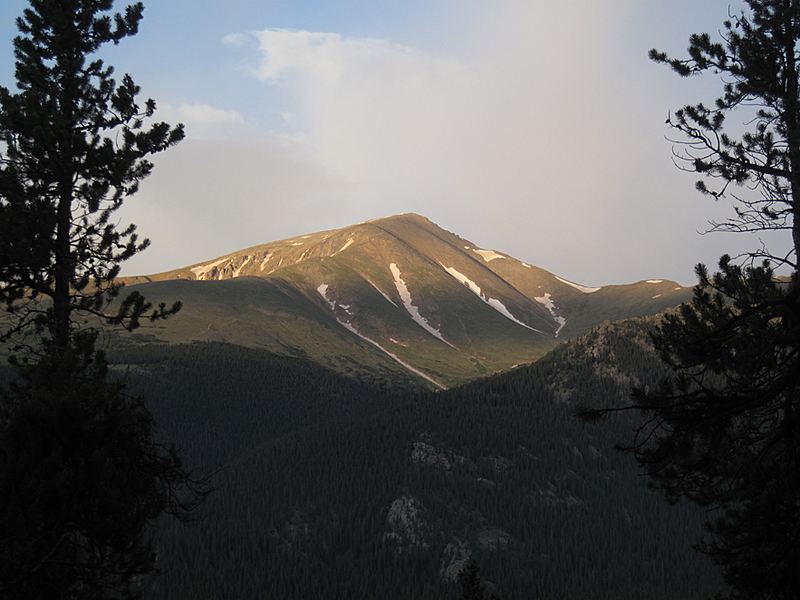 All things considered, Elbert is a powerful yet relatively gentle mountain. 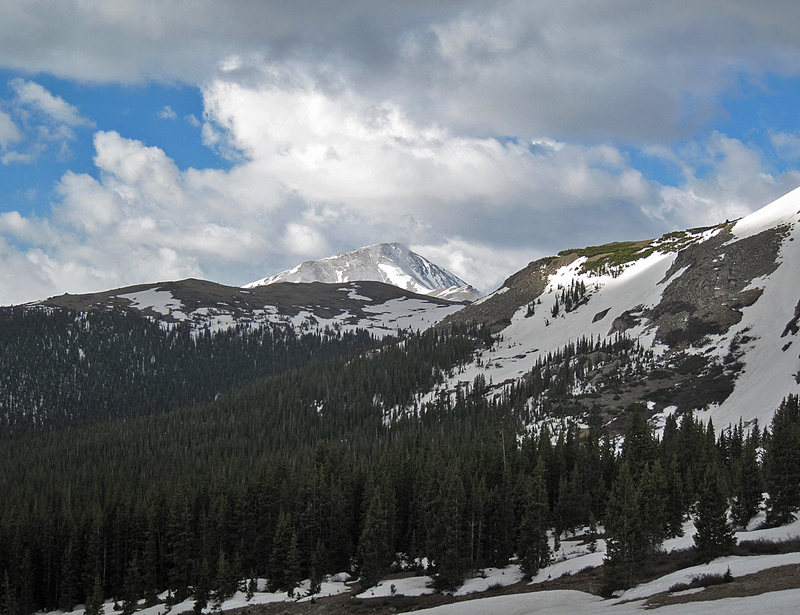 Like many of the Sawatch Mountains Elbert is not a technical peak. Its gently sloping ridges and rounded battlements present little challenge to the mountaineer other than sheer endurance and little danger other than a dusting of loose rock. Solid class 1 trails ascend Elbert from both the north and the south. Elbert’s stature as a state highpoint and one of the tallest peaks in the Lower Forty-eight make it a popular peak to climb, and summer weekends can bring lines and crowds on the peak’s various routes. For those seeking more challenge and less crowds, Elbert is an excellent winter ascent and can be skied without undue difficulty. From Highway 24 approximately 3 miles south of Leadville, turn west onto Highway 300. After .8 mile turn left (south) on CR-11. 1.2 miles farther, follow signs toward Halfmoon Creek and turn right. The North Mt. Elbert TH is five miles farther on the left (south) side of the road. There are several National Forest campsites in the area as well as dispersed camping. The more environmentally correct option is to stay in the developed, fee-based areas. If you must set-up in dispersed areas, please avoid building fire rings, there are plenty already. The North Elbert trailhead is about one half-mile east of the Mt. Massive trailhead (which is on the opposite side of the road). From Highway 82 four miles west f the Highway 24/82 junction, turn north onto Lake County Road 24. Go 1.5 miles past Lakeview Campground to a parking lot on the west side of the road. A popular trail that ascends Mt. 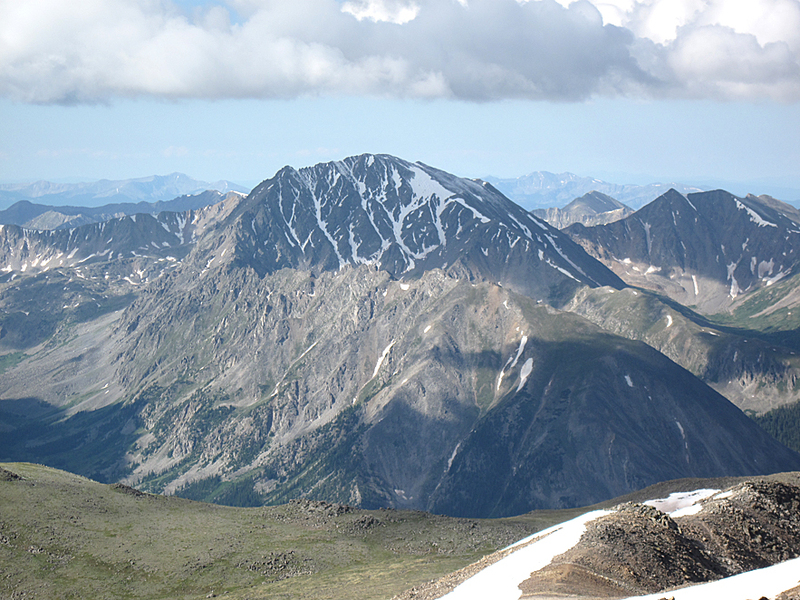 Elbert's north and east slopes from the Halfmoon Creek basin on the Leadville side of the peak. A mostly excellent trail winds around from the north to the east then ascends the northeast ridge of the peak. The trail gets a little rough above 13,000' but never exceeds high class 1. Another popular route that ascends Elbert's east side via a very well-defined and popular trail, the South Mt. Elbert trail. It is a toss-up whether this or the North Mt. Elbert trail is the "standard" route. Both are similar in difficulty and length. This seems to be the more common way to climb Elbert in the winter. A far less popular alternative that allows you to climb the unranked "South Elbert" (14,134') en route to the main summit. This route is accessible from the Black Cloud Trailhead off Highway 82 west of Twin Lakes. A fun slow climb in the winter and probably Elbert's most technical route. Follow the North Elbert trail to treeline. 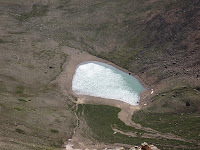 The steep Box Creek Cirque will be visible in front of you. Leave the trail and head for the basin, picking one of several semi-defined couloirs to ascend to the top. This cirque would make a good challenging ski descent. Beware, however, of avalanche potential. Mt. Elbert is a relatively mild mountain, but that doesn’t guarantee you safety. 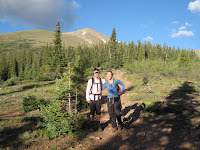 By any route ascending Elbert is a long, strenuous journey that will gain at least 4,000’ and keep you high and exposed above treeline for a considerable amount of time, leaving you vulnerable to thunderstorms, high winds, searing UV radiation, etc. 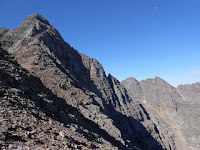 In addition, loose scree in some sections of the trail can be painful for the ankles and knees and the possibility of twists, sprains and breaks, however unlikely, is still there. Take care with your feet, stay hydrated, wear sunscreen, and look out for your fellow mountaineers and you should be just fine. From the trailhead at just over 10,000', follow the North Mt. 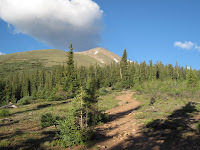 Elbert Trail as winds through a pristine forest on Elbert's northeast flank. Leave the Colorado Trail behind at mile 1.4 and turn right towards Mt. Elbert. This junction is at about 10,400'. This may be a good place for a short rest as the route becomes much steeper from here. Around mile 2.7 you reach treeline, and the upper portion of the mountain comes into view (note: you cannot see the actual summit yet). From this point you have about two miles of hiking left but you still must climb over 2,500' of elevation to reach the top. Once past treeline, the trail begins to switchback steeply up Mt. Elbert's barren northeast ridge. Though the trail is quite good, you may still have to pay close attention to your footing on the steepest sections, especially if you aren't used to hiking on scree at altitude. 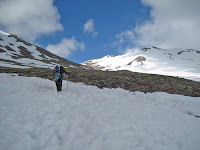 In terms of difficulty of terrain, this route is slightly harder than the Grays Peak trail but not as hard as the South Slopes standard route up Torreys. When you reach what has thus far appeared to be the top, you will find that it is only a false summit and the actual top is still a little farther. Depending on what kind of day you are having this may or may not be discouraging. If you're feeling exhausted, take heart knowing that Colorado's highest point is just under a half mile and four-hundred vertical feet away. On Mt. 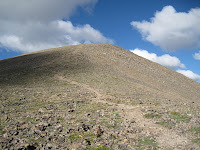 Elbert's summit you will most likely be joined by hikers who have climbed Elbert from other routes, such as the popular South Mt. Elbert Trail. No matter, this commodious summit has something for everyone. To the north you can look out across the Halfmoon Creek area at Mt. Massive and revel at the might of its girth and lofty summits. Also visible to the north and west are centennial thirteeners Mt. Oklahoma (13,845'), French Mountain (13,940'), Casco Peak (13,908'), and "Lackawanna Peak" (13,823'). 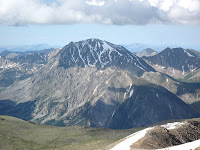 The view to the south is dominated by the familiar shapes and humps of other Sawatch fourteeners, especially La Plata (14,336') whose dramatic north face and rugged Ellingwood Ridge are particularly astounding from the vantage atop Elbert. 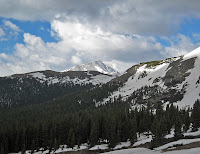 The surrounding mountains are so impressive, in fact, that we once met a man on Elbert's summit who was convinced (and pissed off) that he'd climbed the wrong mountain because others nearby appeared taller. We tried to assure him that distance and perspective can be deceiving and that he was indeed on the highest mountain in the American Rockies.